Casey Stoner and Claudio Domenicali introduce the 2017 Ducati 1299 Superleggera. In 2014 Ducati introduced a very special version of its Panigale with the beautifully executed 1199 Superleggera (or Superlight). It was the logical progression from the World Superbike homologation special, the Panigale R, and it certainly lived up to its moniker with the liberal use of magnesium for the monocoque chassis and forged Marchesini wheels. There was also carbon fibre for the subframe and bodywork with a sprinkling of titanium for the exhaust system, the engines connecting rods and valves, plus various fasteners. 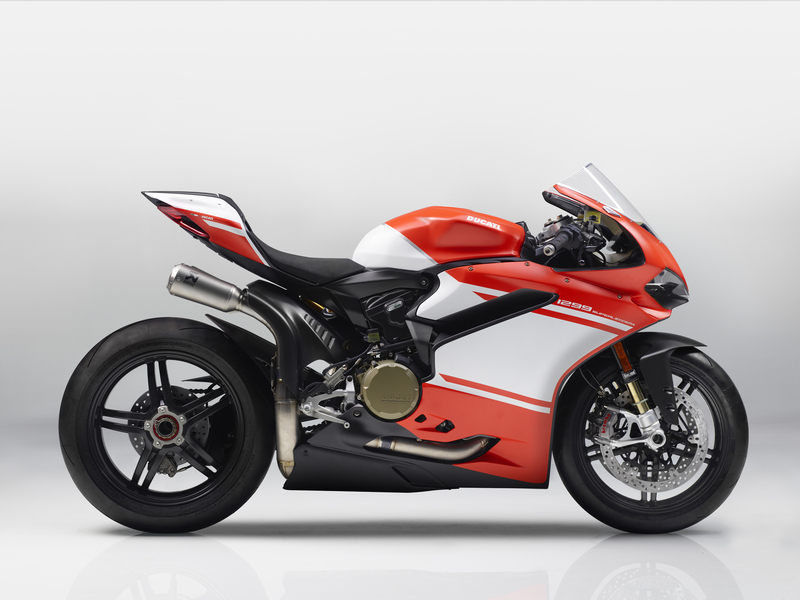 The 1199 was enhanced even further with latest suite of electronic acronyms, and with over 200hp on tap, the Superleggera boasted an outrageous power to weight ratio reputed to be the best of any production motorcycle. Only 500 of these works of art were made. So how do you take the Superlight concept to the next level? Ducati revealed the answer just recently at the EICMA motorcycle show in Milan with the unveiling of the 1299 Superleggera. Understandably it is the search for even lighter weight and more power from the Superquadro engine that makes this motorcycle intriguing, especially with the extensive use of carbon fibre not only for the monocoque chassis and subframe but also the wheels. As a matter of point, when the Panigale was first released in 2011 its aluminium monocoque chassis could trace its DNA back to the Desmosedici MotoGP racers, starting with the 2009 GP9, which used carbon fibre for the monocoque chassis and subframe (and at different times the swingarm). Like the Panigale, it also utilised the engine as a fully stressed member. Casey Stoner tasted a number of victories with the carbon fibre frame, but it was scrapped after Valentino Rossi joined the Ducati MotoGP team in 2011, reverting to a more familiar aluminium twin-spar configuration. Stoner still believes there were benefits with the carbon fibre chassis on the Desmosedici and with the release of the 1299 Superleggera it appears Ducati still have faith in the technology as well. 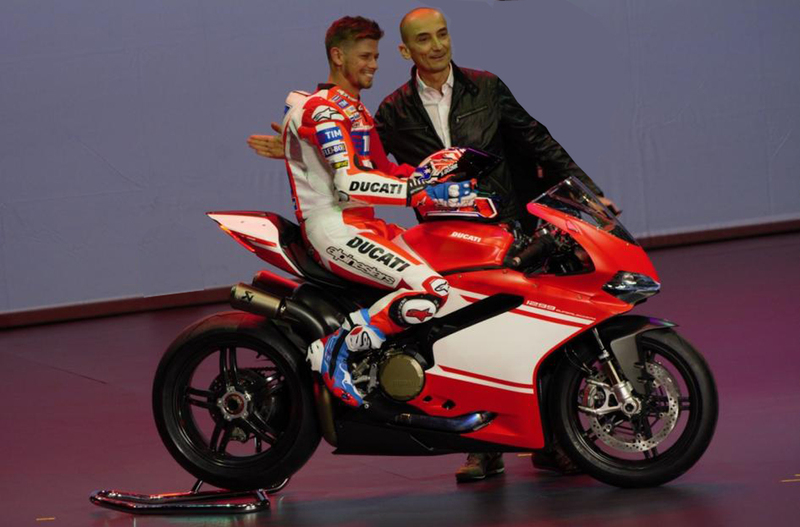 As such, it was appropriate that the Ducati brand ambassador, and MotoGP test rider, rode the new model Superleggera onto the stage in Milan. Again only 500 units will be built. 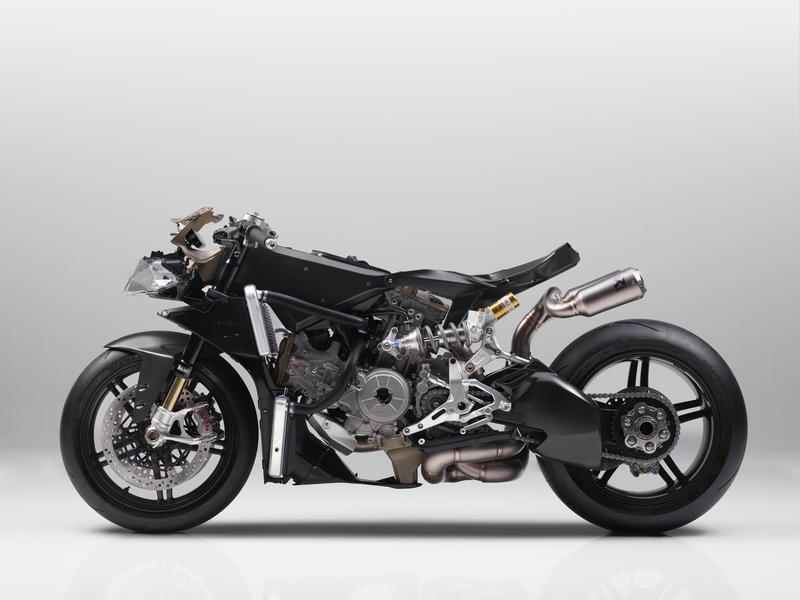 Below is the Ducati press kit, which details this fantastic motorcycle. With the 1299 Superleggera, Ducati takes the world of road Supersport bikes to levels that were unheard of until now: the Superleggera is the first ever factory bike to be equipped with a carbon fibre frame, swingarm, subframe and wheels. The 1299 Superleggera is a gem of engineering, technology and performance. 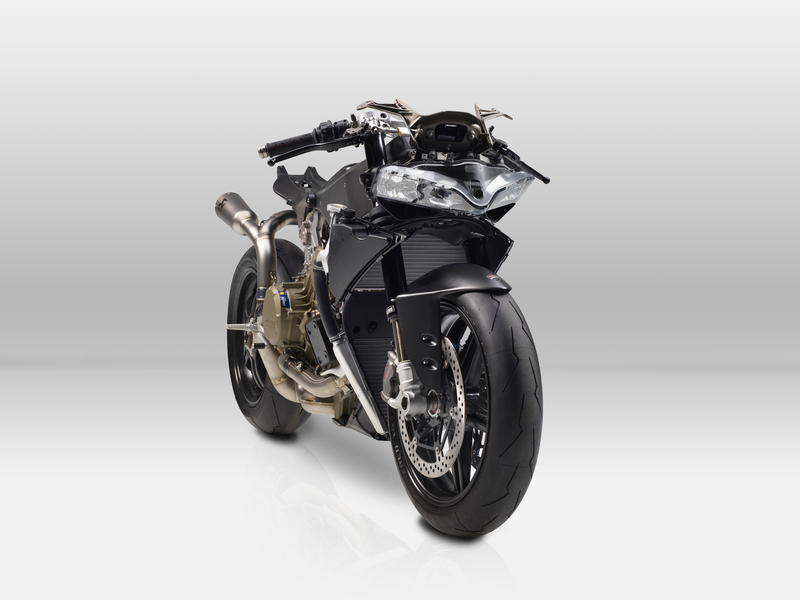 No motorcycle manufacturer has ever produced a factory bike quite like it. With the 1299 Superleggera, Ducati has achieved off-the-scale style, sophistication and performance. Frame and swingarm, made entirely of carbon fibre just like the high-spec wheels, are unique to the 1299 Superleggera. The fairing – also made of carbon fibre – is another key element: but only one of many in an astounding bike that could only ever have been built by Ducati – a manufacturer with racing DNA. The 1299 Superleggera has the word ‘exclusive’ written all over it, even when it comes to the number being made: only 500 such bikes are to be built. Together with the motorcycle, purchasers get a track kit which includes a complete Akrapovič titanium racing exhaust, a racing screen, plate holder removal kit, kickstand removal kit, machined-from-solid mirror replacement plugs, front and rear paddock stands and a bike cover. Carbon fibre monocoque chassis uses the engine as a stressed member. Superleggera looks great from any angle. The Monocoque chassis doubles as the airbox. These checks are made on every single manufactured part to verify their constructive quality. 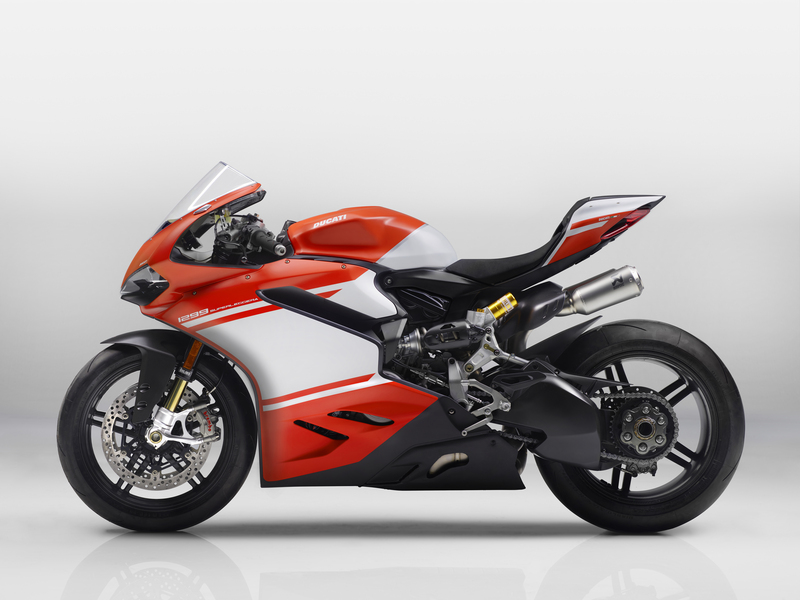 The single-sided swingarm – again made of high-strength carbon fibre and a resin system resistant to high temperatures with 7075 aluminium alloy inserts co-laminated into the composite structure – provides an 18% weight saving (-0.9 kg / -2 lbs) compared to its aluminium counterpart on the 1299 Panigale. The refined chassis set-up of the 1299 Superleggera is completed by Öhlins suspension and true Superbike-calibre Brembo brakes. The multi-adjustable 43 mm Öhlins FL936 upside-down fork on the 1299 Superleggera weighs 1.35 kg (3 lbs) less than the Öhlins fork on the Panigale R. At the rear, instead, the multi-adjustable Öhlins TTX36 shock absorber has a titanium spring that shaves off another 0.5 kg (1.1 lb) with respect to the steel unit fitted on the Panigale R.
A look at the braking system reveals two 330 mm Brembo discs up front, gripped by Brembo M50 monobloc calipers, with new TT29OP1 brake pads, controlled by a Brembo MCS 19.21 radial pump. At the back, instead, is a single 245 mm disc. A whopping 215 hp at 11,000 rpm and 14.9 kgm at 9,000 rpm. These are the incredible power and torque values delivered by the Superquadro twin cylinder engine that powers the 1299 Superleggera. To achieve such performance, Ducati engineers have made profound changes to some of the main engine components, starting with the lightened crankshaft which has a larger crank pin and tungsten balancing pads. The con-rods, in titanium, are new, as are the 116 mm diameter pistons – now with just two segments as on Superbike engines – with machined crowns that raise the compression ratio to 13:1. Another important new development concerns the cylinder liners, in aluminium as opposed to steel as seen on the 1299 Panigale. With the addition of a lighter flywheel, the “engine core” (crankshaft, con-rods, pistons, cylinder liner, flywheel) is about 2.4 kg (5.3 lbs) lighter than its counterpart assembly on the 1299 Panigale (-21.5%). The cylinder heads have also been given an overhaul. The diameters of the valves, both in titanium, have been increased; they are now even wider than those used on Superbike competition bikes. The intake valves have a diameter of 48 mm as opposed to the 46.8 mm on the 1299 Panigale; the exhaust valves have a diameter of 39.5 mm (against 38.2 mm on the 1299 Panigale). Consequently, intake and exhaust ducts have also undergone development, improving fluid dynamics thanks also to new camshafts that offer both improved profiles and increased valve lift. This model has been the focus of intense performance, and weight reduction research and the cylinder heads are no exceptions: their weight has been cut by about 0.4 kg (0.9 lbs). The 1299 Superleggera features a clutch with a new slipper and self-servo system, giving heightened ‘feel’ and ride stability thanks also to the use of a new forged aluminium clutch basket. Increased performance has, naturally, required the adoption of technical solutions to ensure reliability and compliance with noise emissions standards. Numerous parts of the twin-cylinder engine have been modified: for example, the crankcase is now sand-cast, and the new timing system features a “silent” chain. The Superquadro that powers the 1299 Superleggera is not just the most powerful twin-cylinder road engine built by Ducati in its entire history: it’s also perfectly EURO 4 compliant and delivers 10 hp (+ 4.9%) and 0.2 kgm (+ 1.5%) more than the engine on the 1299 Panigale. Moreover, the ultra-light lithium battery on the 1299 Superleggera saves 1.7 kg (3.7 lbs) compared to the unit on the 1299 Panigale. For those aiming to use the bike only on the track, the 1299 Superleggera comes with a track kit that, as regards the engine, includes a complete Akrapovič titanium exhaust. This exhaust is 4 kg** (8.8 lbs) lighter than its road counterpart and boosts power by 5 hp. 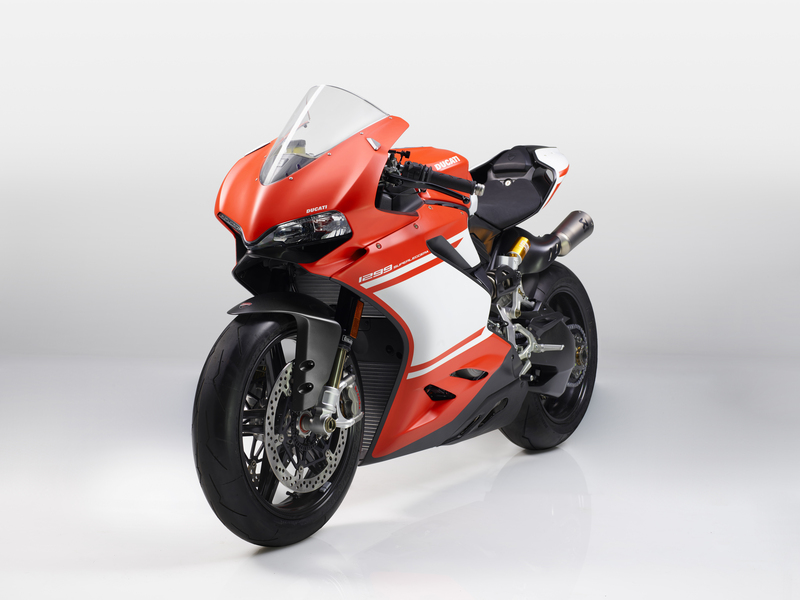 The 1299 Superleggera is the first Bologna-built bike to be equipped with the new electronic package, which makes full use of the 6-axis Inertial Measurement Unit (6D IMU). This electronic package includes DTC EVO, DSC, DWC and EVO and provides the rider with a bike control experience that comes extremely close to that of a MotoGP bike. The DTC EVO on the 1299 Superleggera derives from the system already presented on the 1299 Panigale S Anniversario and is based on an all-new algorithm that ensures faster, more precise intervention. The DTC EVO interfaces with the Bosch Inertial Measurement Unit (IMU), constantly measuring the motorcycle’s lean angle and using it to accurately calculate the degree of intervention needed to ensure suitable rear wheel spin (according to the DTC EVO level setting) and so provide better handling. With simpler types of traction control, detection of rear wheelspin sees the system intervene to hold it in check. When optimal grip is re-established the system reduces intervention until spin reoccurs, and the cycle repeats. This produces a graph that shows intervention oscillating around a theoretical “ideal intervention line” that represents the traction limit. DTC EVO reduces the magnitude of those oscillations, making the system operate closer to the perfect intervention line. This is particularly advantageous in situations where grip changes, such as when the rear tyre becomes worn. In addition to this enhanced intervention precision, when set to “1” or “2”, the DTC EVO adds a new function that lets the user ride the motorcycle at a level that would previously only have been possible for experts or pros. Now, when the bike is leant over, the rider can use the throttle to request more wheel spin than that obtained with the normal intervention level, allowing the motorcycle to pivot around its front wheel and complete the cornering line. DTC EVO allows riders to do this while keeping safety parameters under control, effectively letting then ‘close’ the taken line with the rear wheel. The introduction of the 6D IMU has allowed Ducati Slide Control (DSC) – developed jointly with Ducati Corse – to be added to Ducati Traction Control EVO (DTC EVO). This new system provides the rider with further support by controlling the torque delivered by the engine as a function of the slide angle; its goal is to improve out-of-the-corner performance by preventing slide angles that might otherwise be difficult to handle. The DSC relies on the 6D IMU that provides the vehicle control unit with crucial information about motorcycle dynamics (such as lean angle, acceleration and much more). Thanks to this data – and depending on the user-selected level – the DSC extends the performance range of the bike for everyone, providing improved assistance under extreme riding conditions. DSC has three different settings: switching from level 1 to level 3 results in easier control of slide angles that would otherwise be difficult to handle. DSC intervention levels can be changed by going to the menu, from where you can also set the DTC EVO and DWC EVO values. It’s also possible to set direct DSC control via the Up and Down keys on the left handlebar. The DSC setting is always shown on the display. The 1299 Superleggera also comes equipped with the latest version of Ducati Wheelie Control (DWC). This system – again with the EVO tag – has been overhauled in terms of both controller structure and algorithm, providing a closer link with the rider’s needs. This is an evolution of the system that equips the 1299 Anniversario. Automatic disengagement of the system occurs above the end-of-start speed, or once third gear is selected. To protect the clutch, a specially developed algorithm allows only a limited number of consecutive starts. The number of ‘launches left’ returns to its normal status once the user rides the bike normally. The 1299 Superleggera also features a revised Bosch Cornering ABS system. First of all, it has been recalibrated to take into account the new revolving mass represented by the ultra-light carbon fibre wheels; secondly, it has been equipped with a new operating logic that ensures safer, more effective braking when cornering. This latest system version offers improved ABS control when the motorcycle is leant over, ensuring better performance in terms of both attainable deceleration and safety. Lastly, the 1299 Superleggera is equipped with the Ducati Data Analyser+ GPS (DDA+ GPS) as a standard feature. This system, which includes software (also for Mac users) and a USB-ready data retrieval card, allows assessment of both motorcycle and rider performance by showing specific info channels in graph form. The DDA+ GPS is a latest-generation Ducati Data Analyser system with a GPS function that automatically records lap times when the bike crosses a circuit start/finish line. As the rider crosses the finish line, he presses the beam flasher button and the highly innovative system logs the coordinates of that position and then automatically logs each lap time as the motorcycle completes the lap. An essential piece of equipment for track use, the DDA+ records numerous channels of data including throttle opening, vehicle speed, engine rpm, gear selection, engine temperature, distance travelled, laps and lap times. There is also a dedicated channel to record the torque reduction – depicted in graph form – requested by the systems that make up the new electronics package. At the end of a ride or track session, the data can be downloaded for comparison and in-depth analysis of rider and motorcycle performance. 2017 Ducati 1299 Superleggera vital statistics. Words Geoff Dawes and Ducati Motor Holdings spa © 2016. Images and Video courtesy Ducati Motor Holdings spa. This entry was posted in Motorcycle Racing, Motorcycling and tagged 1199 Superleggra, 1299 Superleggra, carbon Fibre, Casey Stoner, Claudio Domenicali, Ducati, magnesium, titanium on 22/11/2016 by Geoff Dawes.